This is a Professional IV-A Digital Exposure Meter from Spectra Cine. Compact and easy to use, the Professional meters are the most comprehensive, technologically advanced, and reliable exposure meters for cinematographers, lighting designers, videographers, and professional still photographers. This compact and user-friendly light meter provides an easy, economical means of making highly accurate measurements of indoor and outdoor light levels. It measures foot-candles and lux and instantly calculates Contrast Ratio and Averaging and can store up to two readings. Measurement results are displayed on an Electro-luminescent backlit custom LCD screen. It has a digital f-stop range from f/0.35 to f/128 in 1/10th stop increments and an analog bar graph range from f/0.7 to f/45 in 1/3rd stop increments. Box Dimensions (LxWxH) 7.0 x 5.0 x 3.5"
Professional IV-A Digital Exposure Meter (Black) is rated 4.5 out of 5 by 24. Rated 4 out of 5 by Anonymous from Works like it should Dead balls simple to use. I use it to set light values for a particularly difficult person to light. I wish it had a switch to turn it on and off. The button gets pushed easily in my bag and drains the battery . Speaking of the battery, a more conventional, easier to find battery would be nice. You can't just go to Wally World or a drug store to get them. When is someone going to come up with a meter that measures both intensity and color temp? A more robust strap connection would also be useful. Rated 5 out of 5 by Weihan from Most accurate meter out there! I have two of these meters, both in black, that have consistently and unerringly proven to be the most accurate meters I've ever owned, and I've had many. What's more, they are simplicity defined. Simply set the desired ISO and toggle between FPS (for cinema) or f-stop / shutter speed for still photography, and you're set to go. Hit the measure button once and you've got the most accurate meter reading possible, with an astonishingly wide sensitivity range. I've used these meters for over 10 years, and they've been spot-on every time. It just doesn't get more accurate than that. 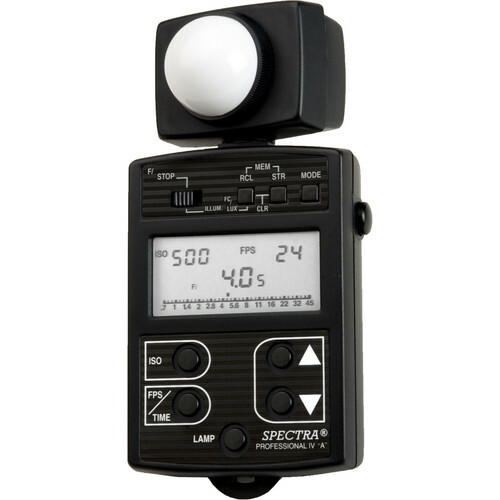 Rated 3 out of 5 by Anonymous from Simple easy to Use Light Meter This is my second Spectrs IV Light Meter. It is simple, easy to use and quite bullet proof. However: This second unit i received was faulty out of the box. Spectra's product support was non existent after two emails...... not good enough. I would definitely look at other option next time as a result. Rated 4 out of 5 by claudio leone from a good choice I use it to cinematography, I'm director of photography, and I think the IV-A Spectra Cine is very accurate and simple to use, includes luminance and F-stop reading, and all cine speeds to set. Unfortunately the batery system is not made with regular AA bateries, but the silver batteries are more stable. If you pretend to shot in jungle, take one or two in reserve. It's seens the better choice if you are looking for a good lightmeter and are not worry in beauty, it is not pretty, but is very reliable. Rated 5 out of 5 by Todd the lighting director from Solid meter handles rigorous daily use!! I use this meter almost every day as I set, check, and balance levels for my lighting for national cable news broadcasts. The meter is consistent and accurate, and gives me all the information I could ask for in a meter at this price level. The warranty provided by Spectra is comprehensive, and more than I could hope for. I have yet to have any problems! Rated 3 out of 5 by Want a decent item from Not too sure Just got this today. It arrived and after looking it over the metal ser# plate on back looked like it got whacked. It is caved in. There is no owners manual. I am not a pro but it looks real cheesy. Switches are fragile and the text screened on the face is already coming off. I emailed the manufacturer to see if I should send it back. Will this also work with strobes or is it only for continuous lighting? This unit is not designed to work with flash. The IV-A has an Auto Power Off feature that shuts off the meter after one minute without use.